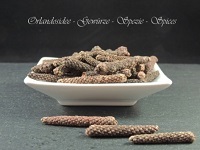 Long Pepper belongs to the pepper family / Piperaceae and has its origin in India. Its aroma is warm and hot with sweet components. Long Pepper goes wonderfully with dishes of the Mediterranean kitchen. Long pepper is more hot than black pepper. The exceptional sweet aroma goes perfectly with Cheese. Just cut some long pepper in smaller pieces and put it in a pepper mill to grind. Long pepper makes also very delicious wine sauces.